12 mix color gerbera flowers in a glass vase. Send this beautiful hamper to your parents on their anniversary to express your gratitude towards them and make it the most beautiful celebration of their life. The fragrance of gerberas is added charms in your memories and makes them everlasting. Keep Out of reach of children less than 2. Keep the stem of flowers in water to keep the bouquet fresh for a long time. A delivered product might differ from the image shown above. 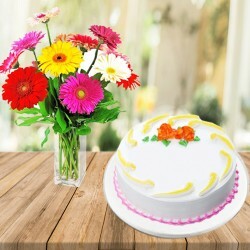 You can increase the number of flowers or weight and size of cake as per your requirements. Delivery may not apply for timings like Valentine’s Day, Friendship day, Mother’s Day, Father’s Day etc.